Granny Squares. Law of a Square. I guess that Granny Squares are the first REAL project for the many beginner crocheters. Secondly, it presents you to the countless opportunities for creativity. 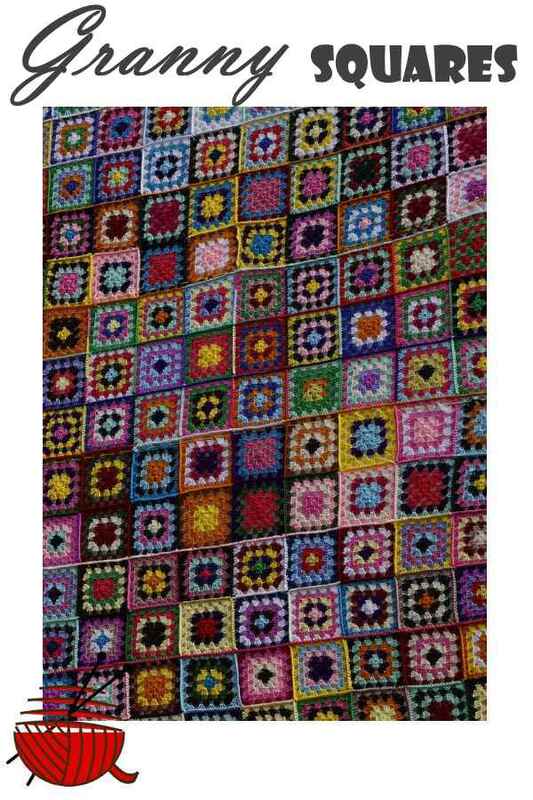 Sew or crochet squares together and here you are: Afghans, blankets, stoles and scarves, ponchos and vests, end etc. Is it too boring for you to crochet only simple rectangular using Granny's? Just be a little bit creative and you can do more complicated projects: skirts and sweaters, tunics and cardigans, coats and whatever you wish. The only "problem" I can see here is too many variations available for the crocheting Granny's. :) Let's begin from the simplest possible Granny's. In this project we will learn how to crochet solid Granny's . 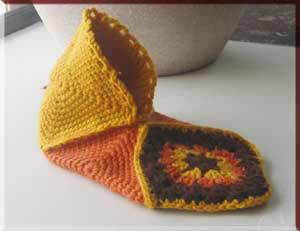 Later we are going to design a Crochet Slipper Pattern based on this lesson. My grandma used to crochet them for the whole family. The main thing in crocheting a square is to keep it flat. Since a square is worked in rounds, you begin in the center of a square and your square grows outward. For a single crochet square (variant a), 8 stitches have to be added in each row (2 stitches per each corner). They can be substituted by the same number of the chain stitches (variant b). In other words, two more additional stitches per each corner are necessary to form a square. For a double crochet square (variant c), 16 stitches have to be added in each row (4 stitches per each corner). Two middle ones can be substituted by the same number of the chain stitches. There are four more additional stitches in each corner, to form a square. There are different ways to add 2 stitches (single crochet square) or 4 stitches (double crochet square) for every corner. You can practice, follow a video below which demonstrates how to crochet a solid Granny's if you use a double crochet stitch to form a Granny. In this video you can see that every corner besides 4 traditional stitches per every corner to add, has two additional chain stitches in the middle (two dc, 2 chain, two dc). It makes a square more lacy than a regular solid Granny. The main thing for you to remember is the number of increases required per each row. If you are the beginner in crocheting, follow the link below. These videos would be very helpful for you. They demonstrate a very detailed explanation about crocheting Granny Square with double crochet stitches. Using Granny Squares for your projects have three main attractions; easy to crochet (Granny squares only! ), looks quite decent, and something which will always be handy and appreciated as a gift.